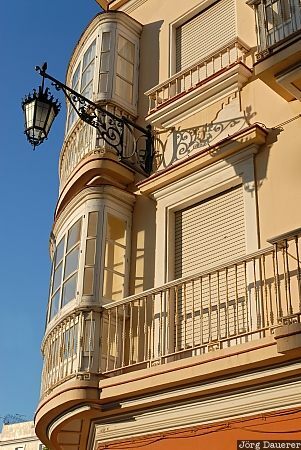 A street lamp attached to a typical facade in Cadiz illuminated by warm evening light. Cadiz is in the south western part of Andalusia in southern Spain. This photo was taken in the evening of a sunny day in April of 2008. This photo was taken with a digital camera.